I used to hate broad beans. My dad used to grow them and force feed us them every Sunday. I would try and hide them under my plate, to no avail. However, some 20 years later I now freely and willingly eat them. And enjoy them! Especially in this lovely risotto. Heat the oil in a large pan over a medium heat and fry the onion, pancetta and garlic for about 5 minutes until the onion lightly browns. Add the rice to the pan and stir for one minute. Add a ladleful of stock and stir until the liquid is gone. Repeat this process until all the stock is used up and almost evaporated. The rice should be tender and the consistency creamy. This should take about 30-35 minutes. 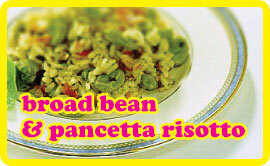 When the risotto is almost cooked add the fava beans together with about 4 tablespoon of the juice from the can or cooking liquid and stir more until the correct consistency is achieved. Stir in the herbs, season with salt & pepper and remove from the heat. Add to heated bowls and sprinkle some parmesan over together with a drizzle of olive oil.